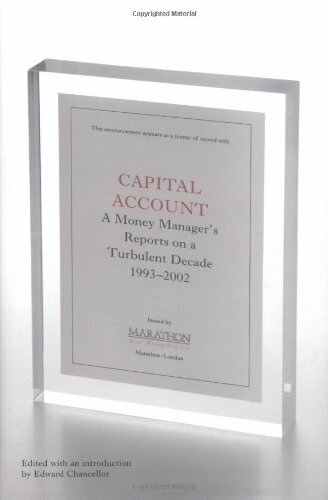 Capital Account relates the story of the world's greatest investment bubble from the perspective of professional investors. The book, comprised of selected reports from Marathon Asset Management, a successful global investment firm, explains how shareholder value - the notion that companies should be run in the interests of their shareholders - became corrupted in this era of frenzied finance. Senior managers, succumbing to the lure of stock option fortunes, took to manipulating their company's earnings. Professional investors, interested only in maintaining their investment performance over the next quarter, were willing abettors. The 'croupiers' of Wall Street, also know as investment bankers, whipped up the euphoria and peddled to investors superficially plausible stories, 'MacGuffins', in order to generate huge fees for themselves. As a result, by the turn of the century almost the entire investment community had become fixated with chasing short-term profits at the expense of long-term returns for clients. By the end of 2002 this cynical game had ended in investment disaster- the world's stock markets having produced more than $15 trillion of losses since their peak. Yet to a large extent, the outcome was predictable to those investors who had retained a disciplined approach to investment analysis throughout the bull market. This book introduces the 'capital cycle' approach to investment - an approach that brings together ideas from the fields of behavioral finance, economic theory and business analysis. Capital cycle analysis - based on the apparently simple insight that investor euphoria leads to excessive investment in the real world and subsequent poor returns for shareholders - enabled Marathon to identify at an early stage the inevitable collapse of the technology and telecoms bubble. If you have any questions about this product by Texere, contact us by completing and submitting the form below. If you are looking for a specif part number, please include it with your message.